Veronika Wild: Have we been dudded all these years? Have we been dudded all these years? I really wanted to put this in for the children. It is one of the most famous sites in Hobart, especially for the under 10's. 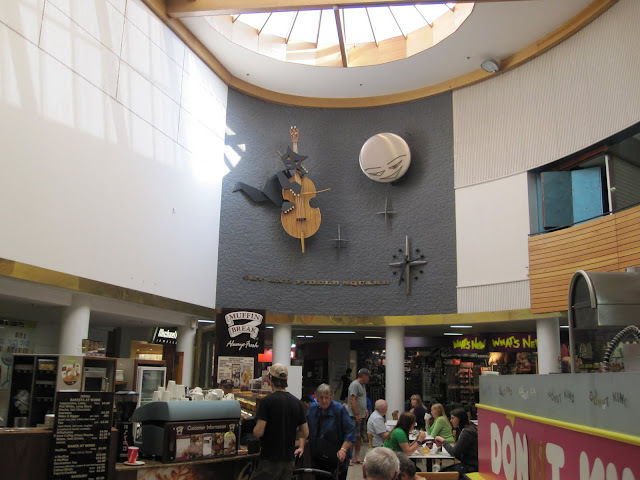 It is in the Cat and Fiddle Arcade right in the middle of town and can be reached from either the Elizabeth Street Mall or the Murray Street end near Myer. Unfortunately my own video of this was terrible so you will have to listen to the YouTube version below. But look closely at this image. As my friend Chris pointed out recently, that's not a fiddle as the nursery rhyme says. That's a cello! In answer to the person who asked on the internet, the arcade opened in 1962, so my guess would be that this moving clock dates from about that time. I still like it.